This salad is a staple in traditional Greek cuisine which many associate with good health and balanced nutrition. The tomatoes and red peppers give the salad a juicy bite. You can prepare it at dinner or for your summer barbecues to impress your guests. It is a simple salad to serve with heavier dishes. Tomatoes and peppers pair well with feta and cucumber in this special salad. It is a light, spectacular, delicious, and easy to prepare overnight salad. You can use garden-fresh vegetables to make the most of your produce. Roast the sweet red peppers on a BBQ or use already roasted and pickled red peppers from a jar. 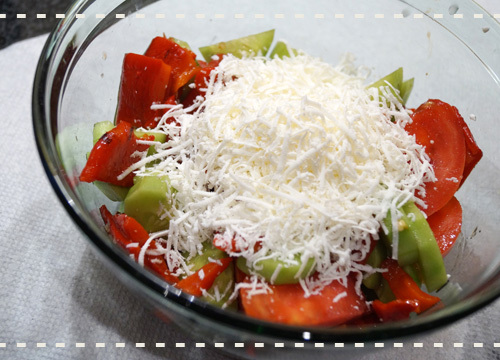 Cut the cucumber, tomatoes and sweet red pepper and combine them in a large bowl.